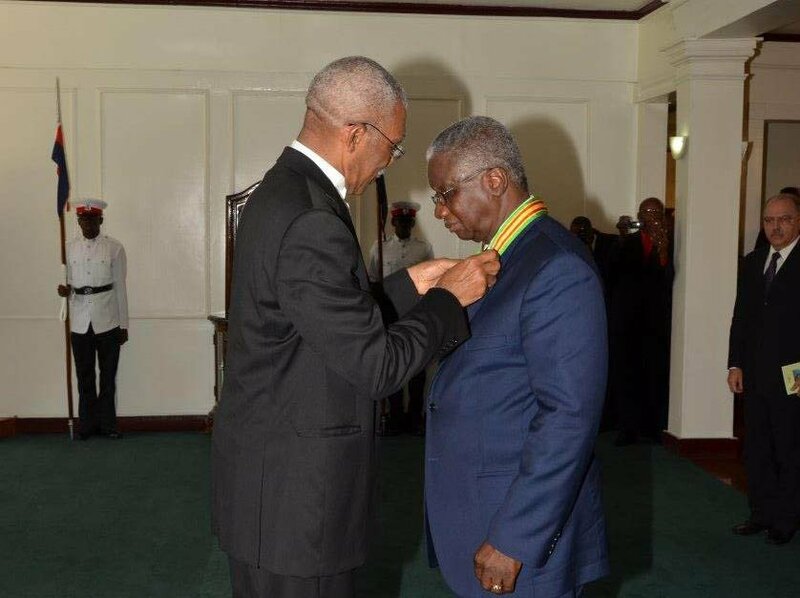 President David Granger, Chancellor of the Orders of Guyana, yesterday conferred Prime Minister of Barbados, Freundel Stuart with the insignia of the Order of Roraima, Guyana’s second highest National Award. The investiture ceremony was held at State House. A release from the Ministry of the Presidency said that the Prime Minister was honoured for his support for the rights of Small Island and Low Coastal Developing States, his advocacy for CARICOM’s demand for reparations for the citizens of the Caribbean Region and his contribution to the reduction of the impact of climate change in the Region. 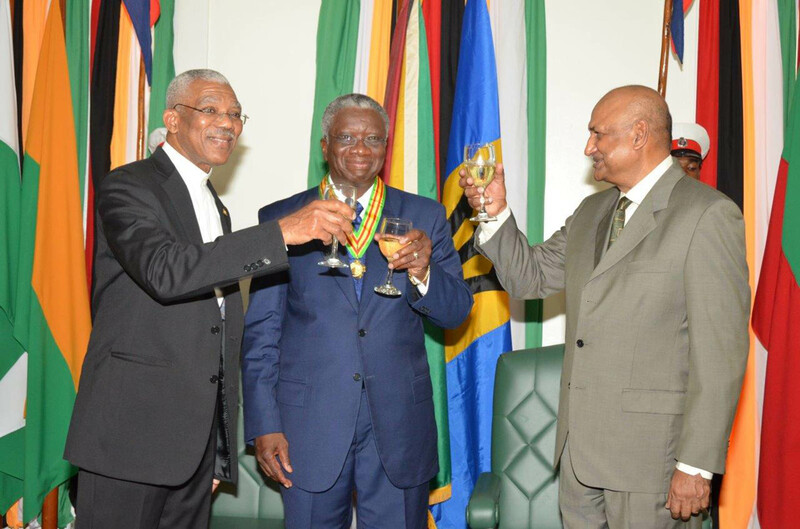 The President noted that both Guyana and Barbados gained their Independence from Britain in 1966 and said that Stuart is known for combining his country’s legendary leadership in regionalism with international activism. “We applaud Prime Minister Stuart’s leadership and stewardship. We commend him for his commitment to the Caribbean Community,” Granger said. Prime Minister Stuart in response expressed gratitude. “It is an important moment for me. I have been a follower of Guyana for many, many years. I’ve been influenced quite a lot by what is happening in Guyana over the years. I was a great admirer of the late President of Guyana, Forbes Burnham and therefore to have been the recipient of this award this morning is a real humbling but delightful experience,” he said. Speaking about bilateral and trade relations between the two countries, the Ministry of the Presidency release said that the Prime Minister stated that concerted efforts are being made by both nations to improve and strengthen the Guyana-Barbados Joint Commission. “We think that it is important that opportunities for deeper collaboration be fully exploited between the two countries. So trade wise and otherwise, we are deepening the relationship… this relationship is going to get stronger and stronger,” he said. 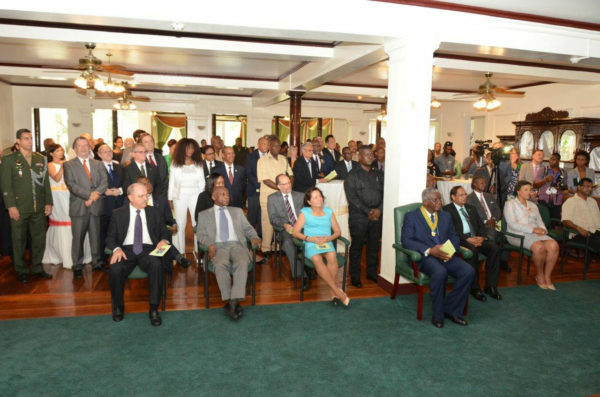 Also present at the investiture ceremony, were Prime Minister Moses Nagamootoo, Cabinet members, Commonwealth Secretary General, Baroness Patricia Scotland, Advisor on the Council of Ministers of Suriname, Ambassador Harvey Narendorff and the diplomatic corps. On Thursday evening at the 50th Independence Anniversary flag-raising ceremony held at D’urban Park, the list of national awardees was announced.